I think that those of us who go to sea do so for the same reason as those before us have gone. Discovery. New places, people, sights, things, and foods. In my travels on Caribbean Soul, I’ve been fortunate enough to make discoveries about the splendid and the mundane, the vagaries of human nature (my own and those of the characters I’ve encountered), about local flora and fauna (Did you know swimming sea cucumbers are a thing? ), and about the artifacts left behind by earlier travelers. So, without further ado, I’d like to introduce you to one of those artifacts, La Ultima. La Ultima is a chug, that uniquely Cuban testament to the undying optimism found in the heart, to the ingenuity of the backyard engineer, to the pits of desperation, and to the courage mustered to escape them. 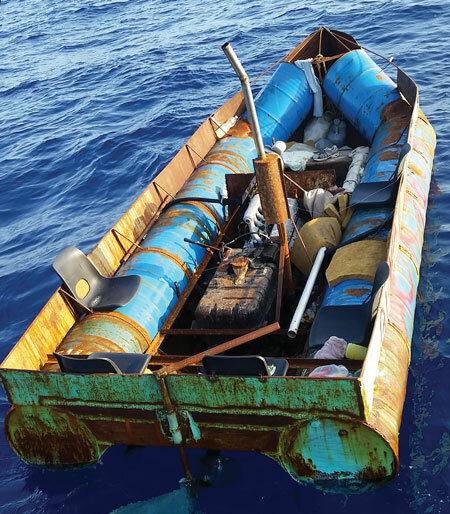 A chug is any manner of craft used by Cuban refugees to make the 90-plus-mile crossing to a better life. Chugs come in all shapes and sizes: inner tubes lashed together, rowboats, scavenged life rafts, really most anything that floats. They are all bound by the common threads of optimism, desperation, and courage. I encountered La Ultima in mid April, an hour or two before sunset in about 800 feet of water, near Islamorada. I was making my way from Key West to Key Largo to visit a bartender friend, “Juan with the bunny,” I’d made on my trip down. The wind was very light, so I was motoring and trolling, while Rosie the Rottweiler napped and Hooper, my autopilot, steered. In the distance, almost directly ahead, I spotted some sort of seafoam green object floating high in the water. My mind immediately turned to the mahi surely lurking below, and I altered my course a few degrees toward the floating debris. As I approached, I began to realize what I was encountering. As I passed, one curious mahi darted out, lit up green and blue to inspect my boat and trailing lures, before retreating just as quickly under his floating home. After a few more passes failed to elicit a strike, I considered jumping in and spearing that delicious rascal, but the thought of becoming separated from my boat by the two-knot current loomed heavy. I quickly passed by that notion. I reeled the lines in and decided to have a closer study of La Ultima. It was a marvel of backyard craftsmanship, and as chugs go, it may as well have been the Titanic. The hull was made of two pontoons, each made of five 55-gallon drums welded together lengthwise. The high and pointed bow was created with two more drums, angled upward and inward. The pontoons and bow area were joined and supported by sheet metal. The boat was about 20 feet long, with an eight-foot beam. As a reformed metal fabricator, I was impressed by the craftsmanship, planning, design, durability, buoyancy, and time investment the design displayed. 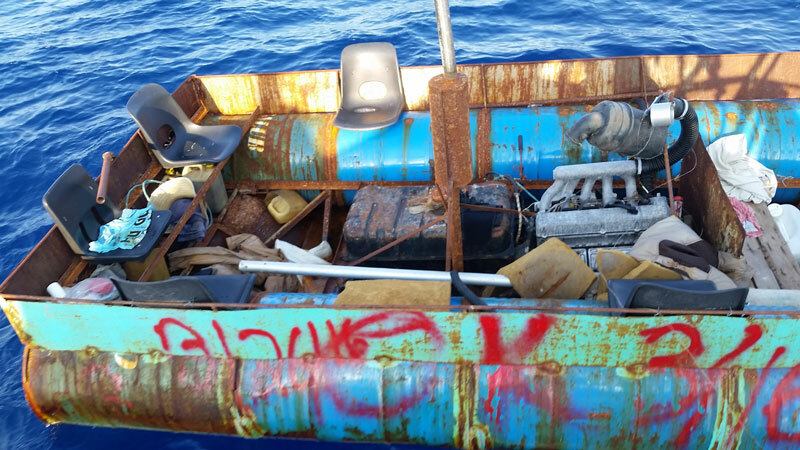 The boat was equipped with plastic seats and was stocked with food and water. There were a few duffel bags of soaked clothes and shoes strewn about. 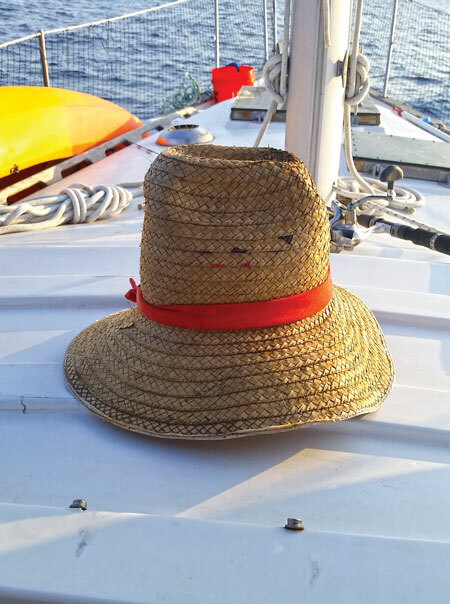 There was also a straw hat that I managed to gaff and bring aboard. Unfortunately, it’s too small for my oversized melon, but I still kept it as a souvenir. If you’ll look closely at the bow, you’ll notice running lights fashioned from two glow sticks. The colors are on the wrong sides, but someone’s heart was in the right place. Yes, La Ultima is a chug. It’s one of the baddest chugs to ever attempt the crossing. But in the end, I have to assume that her mission ended in some manner of failure unknown to me. The craft, and the stories I’ve imagined about its builders and passengers, captivate me in a way that few other discoveries in my travels have. I’d like to say that I discovered La Ultima, but the Coast Guard checked it out twice before I found it. You’ll notice the dates and “OK” written in orange spray paint. I don’t know the fate of the occupants or whether they were onboard when the Coast Guard first found their boat. 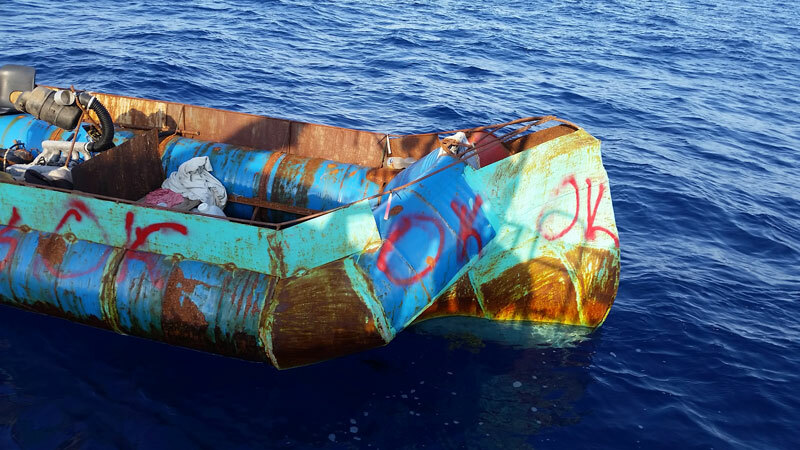 The fact that it was floating miles from land and the haphazard manner in which clothes and shoes were spread around the hull leads me to believe that the boat’s occupants didn’t step off of her in the manner they’d hoped. I like to think about the process of creating La Ultima. I imagine a group of friends gathering in their free time to cut, weld, and grind their way to a far-off goal. They took enough pride to name their craft. Those same friends discussing navigation and stockpiling supplies and sharing the emotions such an undertaking must generate: apprehension of a risky ocean voyage, the hope for a better life, and the relief or despair they must have felt when their voyage ended. And I think of the fate of their creation. I wonder how long it will float as a reminder to other mariners of both the perils of a life at sea and of their good fortunes in life. The idea of crashing into something like La Ultima in the dark of night haunts me as a single hander. I had planned on traveling throughout the night, arriving at dawn, napping a few hours, and then loading Rosie into our kayak and paddling ashore to see Juan with the bunny for happy hour. Instead, I searched my charts to find the closest semi-protected anchorage to sleep away the dark hours. While I didn’t exactly discover this artifact, I did find it. And I like to think that, aside from its occupants, few people have been more touched by this vessel. Its mere existence awoke such gratitude in me that I’d consider it one of the most significant experiences of my voyage. 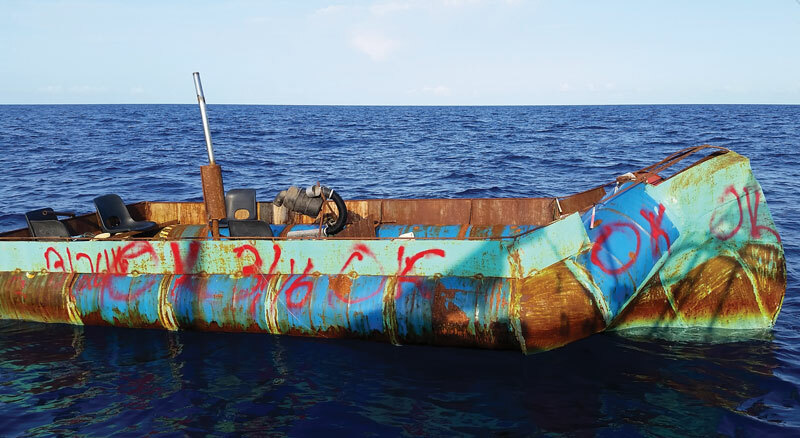 The courage and the ambition and the despair of those refugees found a home on Caribbean Soul. So did their hat.